Location of Vogošća within Bosnia and Herzegovina. Vogošća is marked with number 9 on this map of the Sarajevo Canton. Vogošća is a secondary suburb and municipality of Sarajevo, Sarajevo Canton, the capital of Bosnia, located about 6 kilometers north of the city center and covering some 72 km². As of 2013, it has a population of 27,816 inhabitants. According to 1971 population census there were 14,402 residents. According to 1991 population census there were 24,647 residents. According to 2013 population census there are 26,343 residents. Vogošća greatly prospered during the 1980s, as part of Sarajevo’s great boom in the latter half of the 20th century. It grew to prominence in large part due to its automobile manufacturing industry, having deals with German and Swedish companies, including Volkswagen Group. By the late 1980s, it was the second most industrious and productive municipality in former Yugoslavia. Vogošća was heavily damaged during the exodus of the Serbs who controlled that territory during the war. 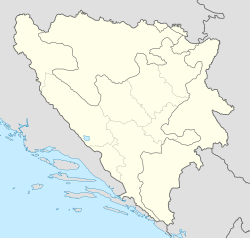 The Dayton Agreement provided Vogošća to be a part of the Federation of Bosnia and Herzegovina. Today, Vogošća is rebuilding and its industries are on the rebound thanks to aid and funds. ^ "BH Popis 2013". www.popis2013.ba. Retrieved 2016-07-25. Official results from the book: Ethnic composition of SR Bosnia-Herzegovina population, by municipalities and settlements, 1991. census, Zavod za statistiku Bosne i Hercegovine - Bilten no.234, Sarajevo 1991. Wikimedia Commons has media related to Vogošća Municipality. This page was last edited on 2 March 2019, at 19:27 (UTC).